Yesterday Lizzy and I made baked potato soup and even after straining it, it was so delicious. Today I'm going in for my first post-op appointment. I'm sitting in the hospital right now, I just got my pano X-rays. It's been fun mumbling to all the staff about what I'm here for. I'm crossing my fingers that Dr. O'Ryan will be taking off the wires today, but I don't want to believe it yet. Even though it's only been 9 days since I've been wired shut, I'm 100% ready to get them off. I hate not being able to talk clearly. I am also completely over this whole liquid diet thing. I can keep doing it, I'm just going to complain the entire way. 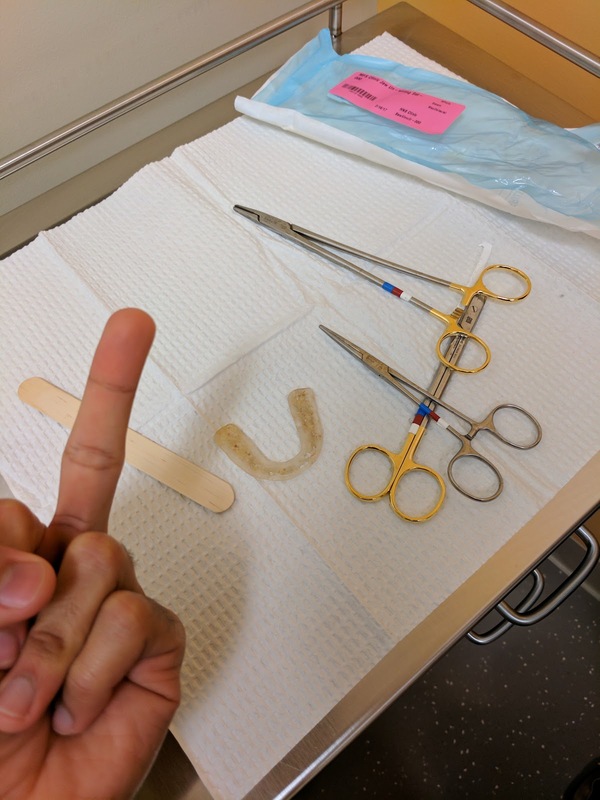 (Update 1:28pm) They took off my wires and splint! I can finally talk for real again! I can breath so easily through my mouth now! It's magical and freeing. My X-Ray has become a lot more exciting now. 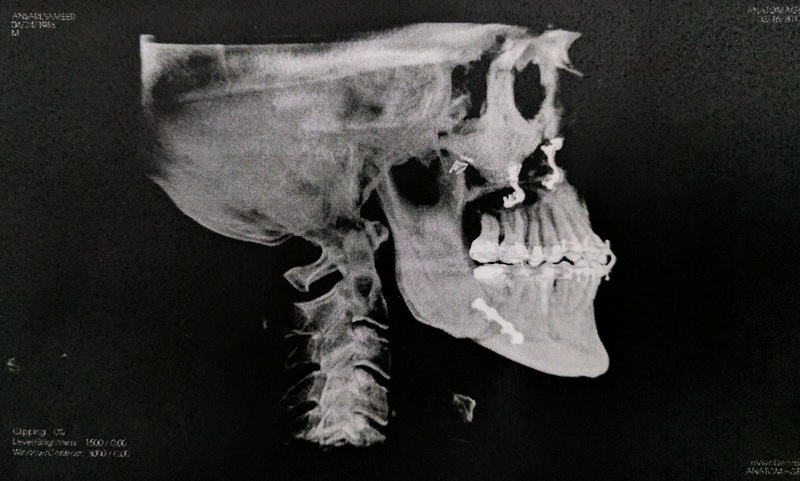 They also gave me a lateral X-ray photo, and it shows my jaws line up quite nicely! The X-ray was from before they took the wires and splint off. Then, during my meeting with the surgeon staff, they had me sit back on a chair and one of the surgeons took some wire clippers to my face. Every so often I'd feel a wire slide by and some strange pressures on my teeth. A minute later, the strangest sensation of this pressure releasing like a steam valve opening, and my lower jaw just magically floated open. He pulled out the splint, and that was the most glorious moment. All of a sudden, I could breath and talk, it was beautiful. The wires and splint are finally off. Here's my teeth now after the wires and splint are off and a nice brush was done. They say I'm healing very quickly, and that I definitely don't need wires anymore. Day 9 : Wires off! This is as far as I can open my jaw right now. It feels very strange to move my jaw, and use the muscles to hold it closed. The surgeons said everything is looking great, incisions are healing quickly, and the jaw positioning looks good. Right now the teeth don't align that well and one of the jaws seems to be canted (tilted) slightly, but that's okay they say, as the orthodontics will fix up the final positioning. I am still a bit worried about that, as I don't know how to keep my mouth closed now since it feels like the teeth meet at one point only. I was able to brush my teeth with toothpaste, and I can actually see my tongue now. It's horrendous, covered in a fuzz. I still can't open my jaws more than 1 finger, so it's hard to get a toothbrush in there, but I tried anyway and had a go at brushing the insides of my teeth and as much of the tongue as I could. Most importantly, I can eat soft solid foods now! MASHED POTATOES HERE I COME! This is so great. I'm absolutely sick of the protein shakes at this point. Now I need to figure out what foods I want to eat. Some of the strangest things so far. Now that the splint is out, my tongue can feel the inside cavern of my mouth. It feels strange, like there's more space in the upper part (which is still numb also), and the lower part feels more cramped now. 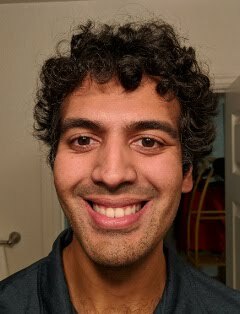 There's actually a roughly 1mm overbite gap now in my teeth, which Dr. O'Ryan said is fine. The elastics are there to keep my lower jaw from trying to regress forward (which would close the over-bite), as well as to keep the two jaws from shifting sideways too much. I have to keep the elastics in most of the time, taking it out for jaw stretching, eating, and brushing. (Update 4:56pm) Talking and eating is a pleasure now. I try stretching my jaw a little bit here and there, to try to get the jaw muscles used to the new configuration. 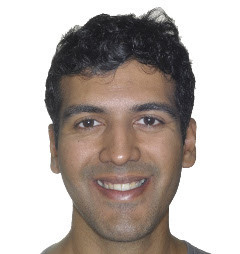 One annoying thing right now is that when I close my mouth my teeth contact at one specific tooth, and I can feel the pain/pressure there and it's quite annoying and uncomfortable. It makes me want to keep my mouth slightly ajar at times, but with the elastics, that's not easy to do. I took a little bit of pain meds to help for now, hopefully my mouth will get used to this soon. My left ear still feels un-popped sometimes, when I talk I can hear it reverberate to the ear. Hopefully this is just temporary. (Update 8:24pm) In my excitement to get solid foods I walked a bit too fast uphill with lizzy and I got a very mild nosebleed. I keep forgetting I'm not yet at full energy. It took a bunch of lying around the apartment moaning while Lizzy made dinner before I felt good enough to move and eat and talk etc. I'm also going to see the orthodontist tomorrow, to see if the elastics need to change, and discuss my teeth alignment. (Update 10pm) Oh, my, god. These crab cakes and mashed potatoes are mana from heaven. My first (soft) solid food since before the surgery. 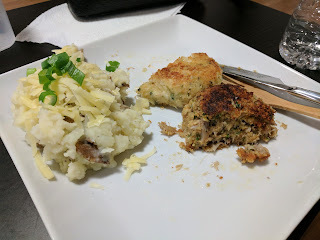 Forking food into my mouth was an adventure that involved sort of smushing it up into my slightly open mouth, and nibbling away at the soft food with my tongue akin to how I'd imagine a tiny gerbil would eat broccoli. It took me roughly a minute to chew/smush each bite. It was so good. I had not realized how much I'd missed the texture of food. The heterogenous mixture of cheese and potatoes and meat tasted great too. An interesting quirk of my upper jaw still being numb, is that as I'm eating food, sometimes the food would 'disappear' in my mouth, because it had traveled to a numb region, and I'd have to go searching for it with my tongue. Sometimes I would think my mouth was clear when it wasn't, and it was only when I talked that I'd realize something sounded off. 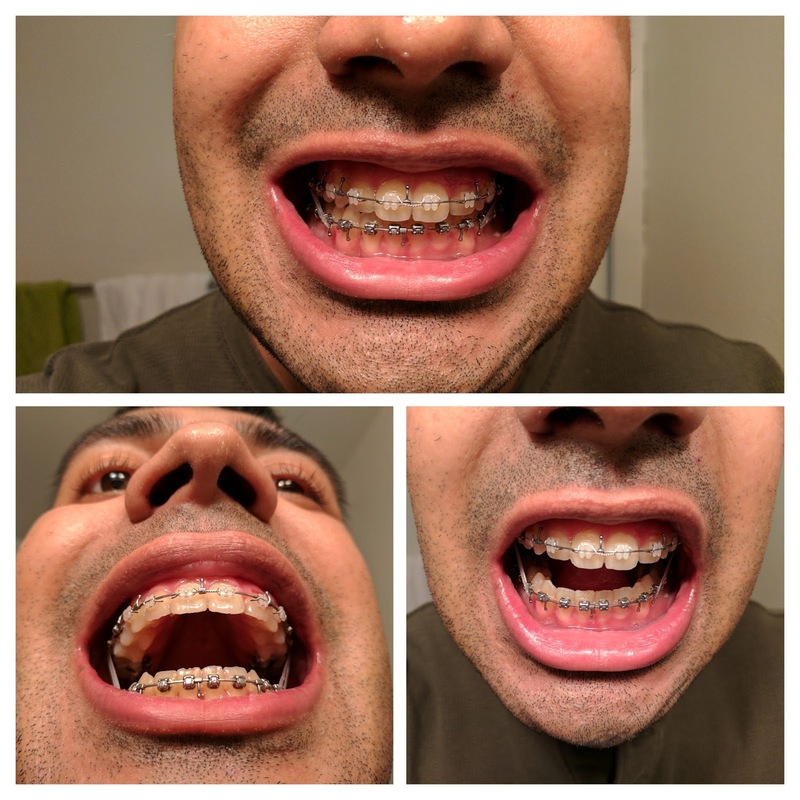 I was able to get a short-notice appointment with my orthodontist the next day to check on the elastics positioning. My surgeon had wanted me to see the orthodontist within the first week just for a quick check on the braces. You are looking very good! I am so glad things are going well! On your video, I cannot see the swelling at all. I like your video. Very informative. You are looking good 👍. Having jaw surgery on the 21st of this month, your story is making things sound a lot better, especially with how fast you got the wires out! Glad you recovered quick, I hope the same for me. Amazing blog really touched on the details I was curious about so I'll probably check out more the sooner my own surgery gets, you're also really funny! Thanks John! I can safely say it was a great decision for me, eating is a pleasure now. I'm still in braces, but fingers-crossed I will be getting them off this coming Jan 2018. Good luck on your surgery!